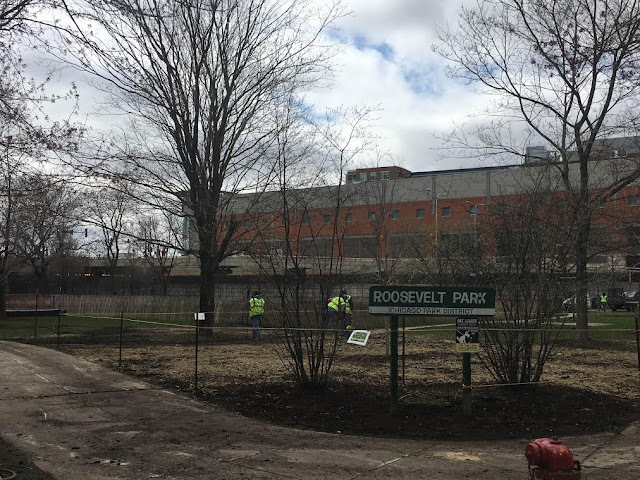 Sloopin - A South Loop Blog: Roosevelt Park Gets Re-sodded; Dearborn Park as Well? Roosevelt Park Gets Re-sodded; Dearborn Park as Well? Came by Roosevelt Park this morning and saw workers positioning heavy landscaping equipment- on my way home just now, the whole grass field has been roped off and work has begun. Was about time for some new grass! Looks like the neighborhood canines need to find a new place to frolic. Additionally, we saw that Dearborn Park (Polk and Plymouth Ct) was roped off so imagine the same thing is happening there. Both parks weren't looking very good so hopefully this helps!